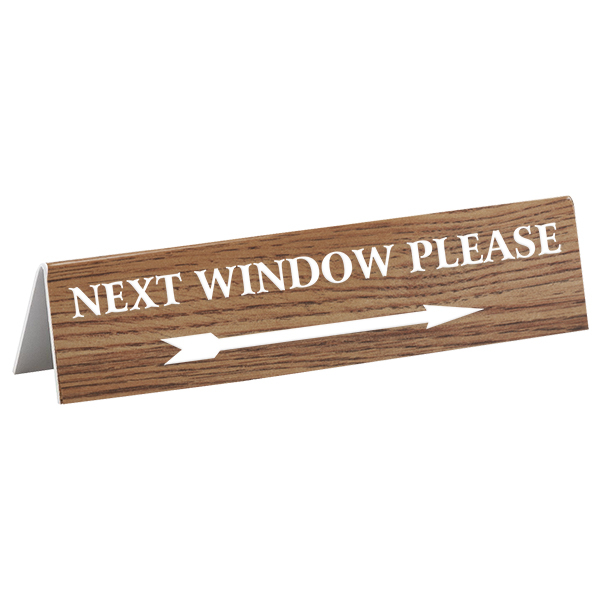 Simply sit this 2" x 8" "Next Window Please" with Arrow Counter Bent sign on the counter in front of your window when you need to take a lunch break or handle other banking business. Choice of engraving colors. Double sided. This 2" x 8" counter bent engraved sign is perfect for bank tellers, medical offices, government counters like the DMV or schools. Simply sit it out on your counter and the arrow will point your customers in the right direction. This Next Window Please with arrow is double sided & is lightweight & easy to set out. Order yours today in several engraving color choices.